Arthur Koubesserian is one of those audio engineers who genuinely thinks outside of the box. He has been doing so since he set up Pink Triangle in the late seventies and his Funk Firm continues the theme with its first tonearm. The Funk FXR takes a radical approach to the problem of resonance by placing a carbon fibre cross section in the middle of a thin, walled aluminium tube. An approach which he claims makes an incredibly stiff, yet light-weight tube that's far superior to the beams found on other tonearms. But isn't that another Rega bearing, we hear you mutter. Yes, at least that's what it is on the outside. On the inside Arthur has replaced the lateral bearings with ABEC 7 ball races from Switzerland. But it's the armbeam that's the most significant – that CF cross-section runs the length of the tube and terminates in a Clearaudio-style slot to which you bolt an aluminium block with fixings for the cartridge and supplied SME fingerlift. Alignment is a matter of establishing the correct overhang, which makes set up relatively straightforward. The FXR is available in two forms. 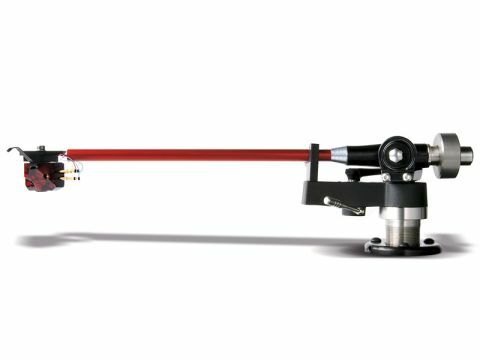 You can buy a complete arm which is based on a Rega RB301 and has a stainless steel shaft rather than the three-point fixing usually found. This version comes with a collar to allow VTA adjustment and costs £1,175. We have the alternative form, which is a modified RB300/RB250, where the customer supplies an arm and Funk installs the new bearing and FXR arm for £900. This version retains the threaded base of the original and thus is less straightforward to adjust for height. However, aftermarket collar systems are available, or you can use spacers. The FXR is a well-executed modification and the parts that Funk adds are machined and finished to a high standard. The tube is anodised in red and the 'headshell' metalwork is anodised black. The way that the SME finger-lift sits between the mounting block and the cartridge can make installation rather tricky, but once it's there it's a very nice lift to use. If you have two cartridges each can be bolted to a mounting block for easy changeover. Perceived value is undermined a little by the Rega bearing section and while we've seen this on more expensive arms (Townshend's Excalibur, for instance), smarter implementations such as that by Audio Mods can be had for less. Funk's argument is that you are getting a Cosworth-style upgrade for your money and the sound quality does bare this out, most tellingly, when you compare the FXR with a standard RB300. The latter sounds overblown and loud with little image focus and quite severe smearing of detail by comparison. But then again, the RB300 only cost £210 in its day, so you'd hope the revision improves matters, but what about something serious like an SME V? The FXR also makes this stalwart sound colourful – the V adds a distinct bloom and muscularity to the sound, which once again smears detail, albeit in rather more subtle fashion. This was a shock. The Series V is a superb piece of engineering and a highly regarded piece of kit, yet it was clear that the FXR delivered more of the music in a calmer and cleaner fashion. The Cosworth analogy would seem, therefore, to be surprisingly accurate.